World Equestrian Games excitement is building! With just days to go until WEG 2018, we’re taking a look back at a classic WEG performance: Tom McCutcheon and Gunners Special Nite winning individual gold in 2010. 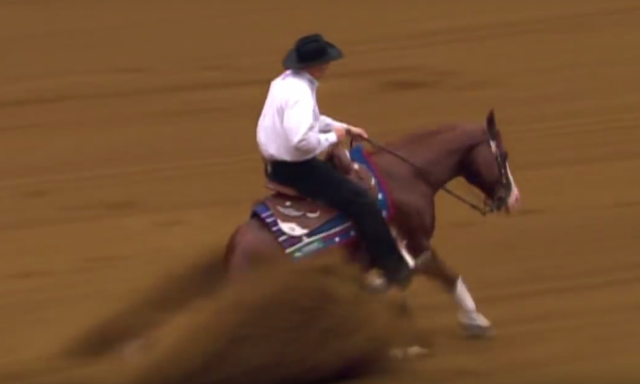 Born in the United States, reining has been almost universally dominated by Team USA since its first year of inclusion in the World Equestrian Games in 2002. The last time the WEG was held on American soil was in 2010 at the famous Kentucky Horse Park, and before a home crowd, Team USA reiners put on quite a show. Starting on September 11, reiners from all over the world (plus dressage, show jumping, combined driving, eventing, vaulting and endurance) will descend on Tryon, North Carolina to contest the 2018 World Equestrian Games. Tom McCutcheon will again represent Team USA, this time aboard The Wizster — and will be joined by his son Cade McCutcheon, riding Custom Made Gun. We’re excited to see this father-son duo lay it down in Tryon, joined of course by teammates Casey Deary, Dan Huss and Jordan Larson.